"The Word of God is a powerful preacher, and it is not too spiritual to be practical, nor too transcendental to be heard and understood." The main feature of the Sunday service is a Bible Lesson-Sermon taken from The Bible and Science and Health with Key to the Scriptures. These two books were ordained to be the dual and impersonal pastor of the Church of Christ, Scientist. Together they preach a sermon each week that is "...undivorced from truth, uncontaminated and unfettered by human hypotheses, and divinely authorised." 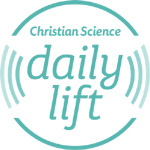 The Bible Lesson-Sermons are published in the Christian Science Quarterly Bible Lessons and designed to be studied in advance. They are available in several different formats that include a CD audio version, a full-text print version, an on-line PDF version, and a special version designed for youth. The Lesson-Sermon may also be studied at the church's Reading Room. 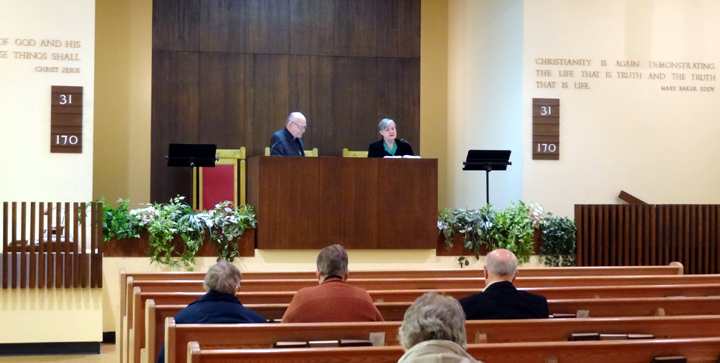 Services are conducted by two lay readers elected from the church membership. 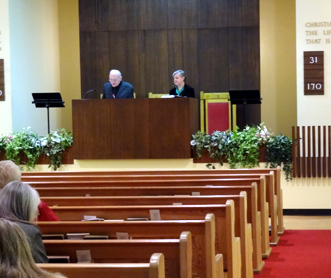 The Sunday service also includes hymns, prayer, scriptural readings, and a solo. Sunday School for young people up to the age of twenty is held at the same time as the service. Child care for children too young for Sunday School is available. from the Mother Church in Boston, Massachusetts. The streaming audio of the Sunday service is available for one week.